I opened my email this morning to the sad news that Marcus Borg died on Wednesday. 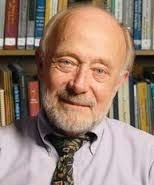 Professor Borg was instrumental in helping me find meaning in Christianity. His book, Meeting Jesus Again for the First Time enabled a generation to find a way to enter or to re-enter the Christian tradition by way of history and metaphor. Marcus Borg was always a gracious teacher. I was fortunate to have him on Religion For Life three times (Evolution of the Word, Speaking Christian). The one I enjoyed the most was the last when he talked about his book, Convictions: How I Learned What Matters Most. I count myself among that number. Sad news. "Meeting Jesus again for the First time" was a game changer for me. In part, I came to your church in Elizabethton initially because one of Borg's books was on the website's reading list. It's far to say that Marcus Borg had a significant effect on my spiritual path, and I am grateful for that. Thanks David. Many of us have a similar story! Thank you, as always, John! Yes, Borg helped me too find (as I call it) "the good Jesus" -- as Thich Nhat Hanh especially has too. Despite the interview you had with Reza Aslan, in which he says he does not portray Jesus as a violent revolutionary in "Zealot," I think the Jesus you describe here is in great contrast to that portrait (being made into a movie). In the interview, Reza seems to think it would have been impossible for the historical Jesus to have had any idea of nonviolence. I was especially surprised when he wrote that "the only God Jesus knew" was the bloodthirsty God who ordered the slaughter of every non-Jew in Israel, explaining "loving the neighbor" in Leviticus 19 by skipping over the instructions in that same chapter about leaving gleanings for the alien and remembering that they themselves had been aliens in Egypt. There's the whole book of Jonah, with God caring about not only the violent Assyrians but also "much cattle" : ) I appreciated so much Aslan's description of Islam in "No God But God," but I think he just leaves out too much of the Hebrew bible to take seriously that Jesus could only have conceived of violent resistance. Bart Ehrman's view, for example, is that Jesus expected God's kingdom soon -- but it would be by God's power. I've been very perplexed by Reza, whom I have admired. If you blogged about "Zealot" and I missed it, my apologies for re-commenting here! But your appealing description here just reminded me how different is "Zealot"s Jesus. Thank you so much again for everything!! We will always achieve unused amazon free gift card so that that codes will redeem at amazon.